Samuel Adegboyega University (SAU) Postgraduate Admission Form, Requirements, Duration, Application Guidelines for 2018/2019 Academic Session. 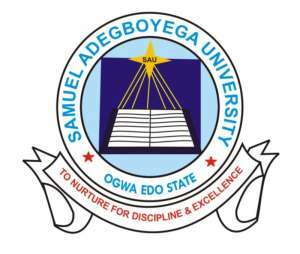 The Management of the Samuel Adegboyega University, Ogwa, Edo State, invites applications from suitably qualified candidates for admission into its Postgraduate Diploma and Masters Degree programmes for 2018/2019 Academic Session. Kindly refer to: Samuel Adegboyega University List of Approved Postgraduate Courses. Candidates seeking admission into Postgraduate Diploma Programmes (PGD) in addition to O’level requirements, must possess a minimum of Third Class in their First Degree or Higher National Diploma (HND) in relevant discipline and/ or professional qualification from accredited higher institution of learning. While candidates seeking admission into Masters Degree Programmes must possess at least a First Degree from Samuel Adegboyega University or any other recognized University by Senate of Samuel Adegboyega University, in the relevant discipline with minimum of Second Class (lower division); Candidates with Third Class Bachelor’s Degree or HND who in addition possess a Postgraduate Diploma (PGD) with minimum CGPA of 3.50 on a 5.00 scale in the relevant discipline, may be considered for Masters. (ii) Professional qualifications in administration discipline are also acceptable (but such candidate will go through a mandatory 9 months PGD programme). (i) B.Th. or its equivalent from recognized Institution/Seminaries is acceptable for M.A. Religious Studies. (ii) PGD/PGDE Religious Studies or Religious Education or its equivalent from recognized institution may be considered. 3. PGD Business Administration: Relevant professional qualifications are acceptable. 4. PGD Economics: Relevant professional qualifications are acceptable. · PGD: Minimum of two (2) Semesters (Full-time) and four (4) Semesters (Part-time). · M.A./M.Sc. : Minimum of three (3) Semesters (Full-time) and six (6) Semesters (Part-time). · MBA and Other Management Sciences: Minimum of four (4) Semesters (Full-time) and six (6) Semesters (Part-time). Candidates should log on to pgschool.sau.edu.ng and carefully follow the instruction. On the payment of non-refundable fee of ₦15,000.00, bank teller enables prospective candidates to complete the Application Form online. Completed Application Form, together with academic transcripts, and other relevant documents should be returned to the Dean, Postgraduate Studies, before the deadline date contained in this publication. Application closes for sale by three months from the date of this publication.